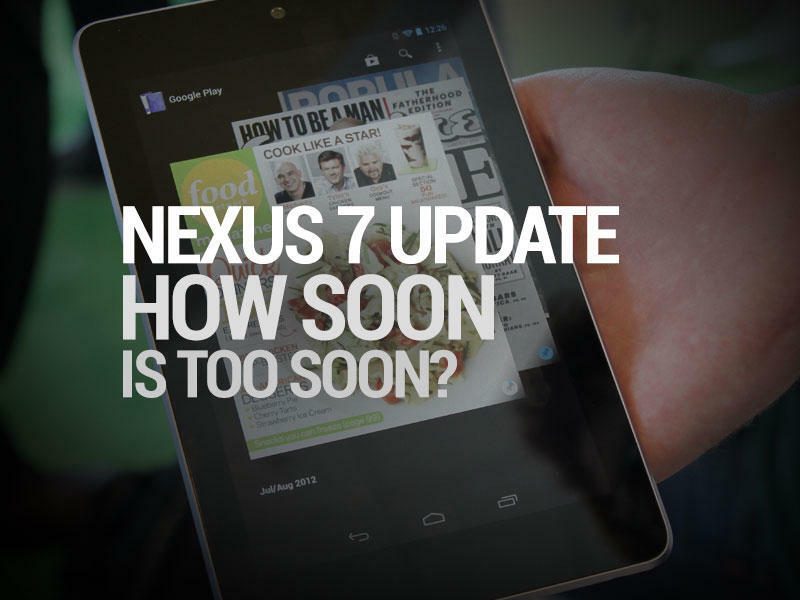 Nexus 7: How Soon is Too Soon to Update a Product? Google announced today that the Nexus 7 now comes with 16GB of storage for $199, and 32GB can be had for $249. Those of us who bought one this summer? Suckers. Back on June 27 of this year, ASUS and Google unveiled the Nexus 7 tablet. It looked awesome. It was the first device to come with Android 4.1 Jelly Bean. The pricing wasn't too bad at 8GB for $199 and 16GB for $249, so why not pick one up? The first wave of devices hit most consumers hands on July 17, or 104 days ago. Once it was in everyone's hands, the reviews were pretty darn positive. Now one has to wonder why the two companies involved with the Nexus 7 decided to chuck all of that goodwill out the window by doubling the memory available at each price point a mere 104 days later. We had been hearing rumors of a 32GB Nexus 7 for some time now, but it seemed that it might be a third option and come in at a higher price. As the Google event that-never-was drew closer, it seemed more and more likely that the prices would indeed remain the same, and those of us who bought the Nexus 7 already were going to be left saying, "really?" If you thought Apple screwed New iPad owners, is there even a word for this one? Yes, there is, but it isn't one we would run on TechnoBuffalo. Every company has a right to update their products whenever they see fit, but at the same time I think there has to be some sort of cut-off point to how soon is too soon. While I had some issues with the iPad 4 update at first, I finally figured anything over half-a-year really wasn't that bad, but just slightly over three months? That just seems to be a poor business decision. At that short of an interval you really have to wonder if it wouldn't have been better to hold the device and release it now as opposed to back in the summer. And then another question arises – how much consumers should trust a company that does this? The Nexus 10 was announced today, should we expect to see it updated shortly after Christmas? This is an argument that could come off sounding like sour grapes, and I realize that, but I view at as more of an issue of trust. These companies release products at a frantic pace already, they want us to run out and buy them, but if they keep these sorts of practices up,then we might just start to say: "Well, maybe I should wait a few weeks to see if they'll update." And in the end that could end up backfiring on everyone. So, yes, the new Nexus 7 looks awesome, but lets hope this sort of update cycle isn't an indication of where the industry is headed.